Graham crackers are sweet, but they do not taste like cookies. 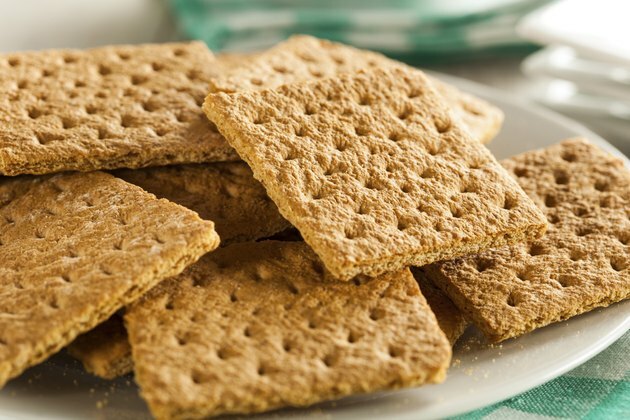 Historians credit a Presbyterian minister, Sylvester Graham, with the creation of Graham crackers around 1829. Modern graham crackers bear little nutritional resemblance to the original one, but the suggested serving size makes them a quick, low-calorie snack. Packaged graham crackers often have a rectangular shape. Each cracker usually contains a scored line that lets you break it into two squares. The actual size of the rectangles and squares depends on the manufacturer, but generally, a full graham cracker sheet refers to the rectangle, before you separate its parts. The companies that make graham crackers use the rectangular sheet to suggest serving sizes, as a rule. The standard serving for adults is two full graham cracker sheets that weigh approximately 28 g, according to the USDA. This serving contains 118 calories, 2 g of protein, 3 g of fat and 20 g of carbohydrates, of which 8 g are from sugar. Most national bakers also use similar measurements as the standard serving size for their packaged graham crackers. Infants and children often consume graham crackers as a snack or a treat after meals. Parents who want to serve their children graham crackers should not use the adult serving sizes on boxes of packaged crackers. The appropriate serving size for children between the age of 3 and 5 is one-half the adult serving or approximately 13 g. For children ages 6 to 18, the full adult serving of two rectangular crackers is appropriate, according to the Connecticut Department of Education's Office of Child Nutrition. Graham crackers may also have imaginative shapes, sugar topping, honey, or a chocolate coating. In most cases, manufacturers suggest the same serving size for plain and specialty graham crackers. However, chocolate and other calorie-increasing enhancements do not increase the nutritional value of plain Graham crackers. Consumers should read the nutritional labels on Graham crackers before eating them. The standard serving of chocolate-coated Graham crackers contains 137 calories, 1.6 g of protein, 6.6 g of fat and 19 g of carbohydrates, of which 12 g are sugars. You may need to cut the recommended serving size by half to keep your healthy snack from ruining your diet with unnecessary fat, calories or sugar.